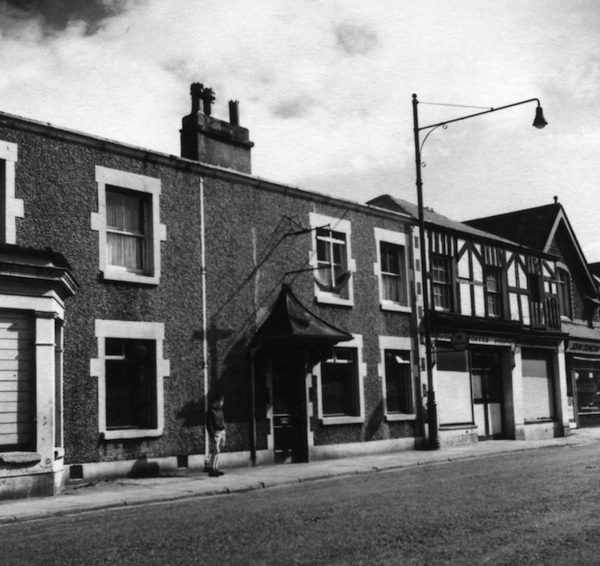 Many thanks to regular contributor Charles Morris for sending me some great photos of two old Hoylake pubs. The photos were taken in about 1960/61 just before the pubs were demolished. 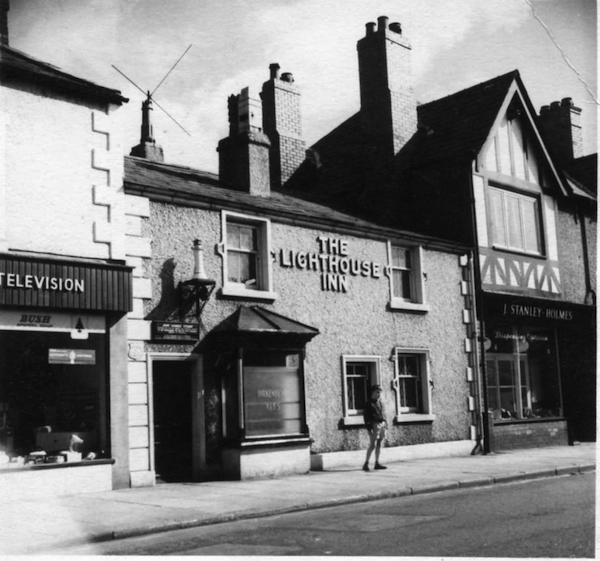 The photo above is of the old Anchor Inn which stood pretty much where the Blue Anchor is today. To the right you can see a shop front that today is the Hoylake Fisheries fishmongers. In this previous Friday Photo from January you can see another view of the pub. Below is a fantastic photo of the old Lighthouse Inn. It was located right where the entrance now is to the car park in front of Holy Trinity School. To the left was an old telly/electrical shop by the looks – today it’s Mansells Antiques. Was that a model lighthouse on the roof? That young lad stood outside is none other than Mr Charles Morris! I agree- great pics. Did your father take them Charles? Am I right in saying that one if not both those pubs could only sell beer, they didn’t have a spirits licence?? How Market Street has altered in 40 odd years. Yes, my father took them. The originals were better quality but I only scanned them at standard resolution. I’m not sure about the licensing situation but what you suggest is quite possible. I know the White Lion in West Kirby had only a beer licence, so it was a feature of those times. For other readers’ benefit, the “telly” shop to the left was T.W. & Guy Warbrick. Previously it had been a fish and chip shop. Warbricks used to be in the right hand shop adjoining the Kingsway cinema, but were displaced when that building was demolished. My dad was the manager of the old Anchor Inn from about 1952 until the Blue Anchor was built. I spoke to him today and he told me that the Anchor and the Lighthouse had a beer and wine licence only. It’s great to see these old photos and remember things from those happy days. The steps I remember are the ones I fell up coming out of the Lighthouse after too much Mild…..
J Stanley Holmes was an optician, I bought glasses there, and the girl serving had previously worked on one of the first digital computers – the “Deuce” which ran on valves. She tapped the valves to see which ones were faulty! Talking of valves, the TV aerial on the roof is an old Band I aerial for BBC 405 line B/W. When ITV started up you needed a Band III aerial which was a multi element “toast rack” often combined with the larger “X” or more expensive “H” aerial. I still see some of them today, valiantly clinging to chimneys! As I mentioned in a different post, the Fish and Chip shop was “Fletchers” and they talked with a “right Lancashire” accent. My great great grandfather was Thomas Hughes and he owned the old Punchbowl Pub in the late 1800s. His daughter, I believe Mary Lizzie then took it over and later another family took over. My great great grandfather, Thomas, was married to Anne Harding whose family was from Wrexham, Wales. My great grandfather, was William Croxton Hughes…born in 1858 and the family lived on Market Street. There is a new Punchbowl Inn there now. Wonder if anyone has any history of the owners of the original Punchbowl or if the new Inn has a plaque with information on it about earliest owners…..I understand that some distant cousins from the Rainford family were even born in the old Pub. I have just seen the photo of the LIGHTHOUSE pub. It has brought back some memories as my Mum and Dad ran the pub around about 1956 till it was shut down. That was just before the new BLUE ANCHOR opened. Has anyone got a local map of the area from 1936 onwards with landmarks? My Mum moved into the CoastGuard cottages when she was 11 years old with my Grandparents when he became a coast Guard after finishing his acting naval career. She loved the cinema which I believe was close and often talked of people getting caught out in the tides on Hilbre island. She was a member of the sea rangers and loved Hoylake. She left after marrying in St Hildeburgh church in 1948. My problem is that most of the buildings I have found out about have been demolished and I can not work out their relationship to one another on a map. Any help would be gratefully appreciated.